Leh(Ladakh), November 06 (Scoop News)-In order to honour the survivors of Hot Springs ordeal of 1959, District Police Leh under the supervision of SP Leh Miss Sargun Shukla-IPS hosted a high tea at Indus Hall of District Police Lines. The CRPF veterans namely Shri Kunzang Dechan, Shri Sonam Dorjay, Shri Sonam Wangyal and daughter of Shri Abdul Majid who are the living survivors of the Hot spring ordeal narrated their first hand experience to the officers . A short film on the Hot Spring ordeal was also screened showing the highest level of chivalry and sacrifice of the officers and jawans while fighting for the motherland with the People Liberation Army in the year 1959. SP Leh while honoring the veterans said that the sacrifices of the Hot Spring ordeal will never be forgotten and the way survivors fought to protect our motherland will always give us the example of highest level of chivalry and bravery. Mementoes were also presented to the survivors to honour them. Present on the occasion were SP CID Leh Sh Stanzin Losal-JKPS, Dy.SP Hq Leh Sh.Ishtyaq A Kacho-JKPS, Dy.SP DAR Sh.Suraj Singh, Sr.PO Leh Sh.Tsering Puntsog and other officers of District Police Leh. 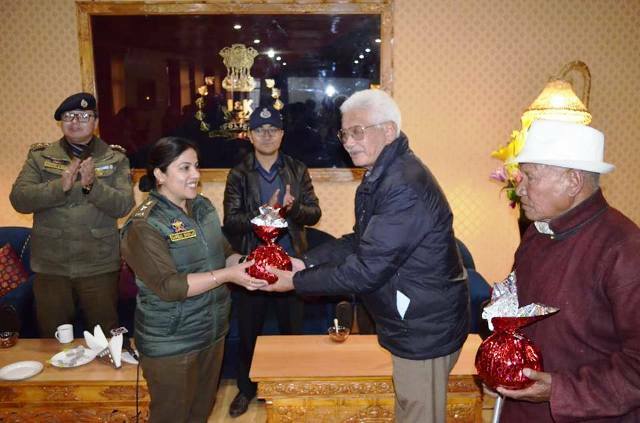 Later, the veterans thanked District Police Leh for such an honour which they have always deserved. It is pertinent to mention that to remember the sacrifices of the Hot Spring ordeal, 21st October of every year is commemorated as National Police Day all over the country.